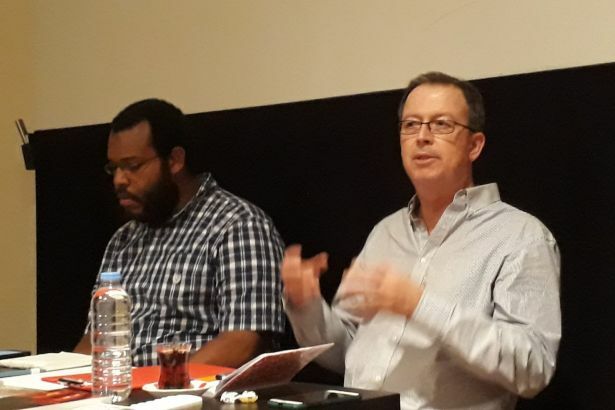 International Communist Press interviewed Central Committee members of the Party for Socialism and Liberation (PSL), Eugene Puryear and Brian Becker during their visit to the Communist Party of Turkey (TKP) late September. PSL CC members conveyed their views on the imperialist agenda of the US, the working class struggle, the issue of immigrants in the US, about the PSL and its involvement in these struggles. The first part of the interview includes the effects of the mobilization against imperialist interventions in Syria, the opportunity arising from the popularization of “socialism” in the US, the recent struggles of immigrants within the US working class and the positioning of US communists in the world communist movement. ICP: We know that PSL has defended and is still defending proletarian internationalism and fighting different military attempts of US in different parts of the world and you say that you approach the peace question from where Lenin approached hundred years ago. Now, by which means are you disseminating this consciousness among workers and how do you organize among masses? Brian Becker: So, for the Party for Socialism and Liberation on the issue of war and peace, imperialism and militarism, we do a great deal of work through a mass organization called the ANSWER Coalition which stands for Act Now to Stop War and End Racism. There are a couple of characteristic features of this work: One, the organization is action-oriented. So, it is designed to leap into action in response to US military actions or interventions or threats against targeted countries. The ANSWER Coalition has been the foremost organization in recent years in US, holding mass protests against US intervention in Syria. Specifically in August and September 2013, when John Kerry, US Secretary of the State demanded that Obama administration begin a major war against Syria because Syria had purportedly crossed Obama's red lines regarding the use of chemical weapons, we organized protests all over the United States. They were really significant in an unusual sense because there was a great grassroots opposition to another major war in the Middle East and it wasn't simply coming from the left. It was also coming from broad sections of American [United States] population and it was also in an international scope. We saw the same phenomenon happening in the United Kingdom. So much so that the House of Commons for the first time in more that two hundred years defied the government and said "no", that Britain wouldn't function as a junior partner in another US war in the Middle East. And at the same time, we staged protests right in front of the White House with large numbers of people. We were chanting "No war against Syria" at the very moment President Obama had scheduled a press conference in the Rose Garden outside of the White House to announce America's plans against Syria. And inside the White House, the Obama administration was hesitating, uncertain about what to do. And the media that was there set up for the press conference, knowing that there was great hesitation and uncertainty about whether the US should do this, engage in another major war. The media was reporting the only thing we hear coming through the White House live feed was our chant: "No war against Syria!" So, the chant was actually going right into the White House and the media started to report it as an expression of the 60 percent of Americans who said they opposed the proposed airstrikes. About an hour later, President Obama came and announced that he had decided to let Congress decide whether or not there should be military engagement in Syria — meaning that the Obama administration was hesitating, having an internal debate that felt all of this pressure from United Kingdom, from different grassroots sectors, from demonstrations, and from the media, which was reflecting this pressure. As a consequence the US didn't go forward. Now, that's one of those instances where sometimes what people do actually can have a profound impact on political decision making. Not all the time, but sometimes there has to be a congruence of efforts. But I can say with absolute certainty that if there had not been manifestations of pressure from opposition, those within the Obama administration who were demanding a military strike would, in fact, have done so. Now, what would have happened? It is very likely that there would be a regional war. Because Iran would have been drawn in. Of course, resistance fighters and Lebanon would have been drawn in. It was actually a decisive moment. And that's the view of our party that we never underestimate the potential that the mobilization of people can make a difference. And so, ANSWER Coalition did this for Syria, as we did during the war in Libya, even though these were unsuccessful. In addition to having immediate responses to provocations, we also organized to warn people about looming dangers with US foreign policy on Venezuela. We have been on the streets over and over again as Obama first declared Venezuela to be a “national security threat” and Trump administration said “all options are on the table,” meaning that the possibility of military action in covert or overt nature. We've been demonstrating in opposition to any US intervention in Venezuela. We can go, I would say, all over the world because US is threatening Latin America and the Middle East and Asia, and now Russia and China. For us, in the PSL, having a strong internationalist, anti-war front shows and demonstrates to American workers that a war, an occupation, an intervention or sanctions against targeted countries and people is only in the interest of capitalists. We are not “all Americans” with common interests. We have a bourgeoisie and a working class and this is a foreign policy for the interests of the bourgeoisie. And finally, the other part of our work is to make the point that at the very moment the US government is eliminating vital social services for the working people and poor people in America, it has increased the military budget in the most extravagant way in the last year. The United States' budget for war spending is officially more that $718 billion. That's greater than Russia and China and the next eight countries combined. And all of this money, which is going for weapons of destruction, for the mobilization of US military, for the maintenance of 1,000 military bases around the world comes at the very moment the government says "Oh, we don't have money for education or healthcare or housing.” So, we make the argument with working class people that the military budget itself is not about national security, but about the security of the capitalists, the banks and the corporations and the US empire and it's actually detrimental to the security, the personal security of working class families that rely on social programs, the funds for which had been reduced so that that money can be used for military expenditures. Eugene Puryear: The only thing I will add in the context of this work, one thing that is very important for us is that we do quite a bit outreach to these organizations of various types, whether it be labor unions or groups working on housing. We encourage them to participate in the anti-war demonstrations or other activities we may be doing and to speak to their own base of workers about these issues. In America, there are a lot of attempts saying that you should only work on domestic issues or economic issues; you should never talk about imperialist issues. So, we always work very hard to outreach to our friends and other organizations to challenge this view and to say that there is a direct connection in the context of imperialism, as Brian was saying, to what is going on at home. In your own words you should explain to your base of workers why these wars don't work for them. So, we don't subscribe to what many organizations subscribe to, this idea that you shouldn't mention issues of imperialism in the context of the broader domestic struggle. We try to expand the struggle against imperialism beyond just the groups or sets of people who already maybe know something about the issue and care about it. Beginning in 2013, PSL identified the popularization of the socialist ideas in the US society as a priority, and saw a great opportunity in this. Has this continued after 2017, including the start of Trump administration? What is your experience in combining socialism and working class struggles especially in the past a year and a half? BB: We’ve established a strategic framework that identified the absolute need to popularize socialism in America because the concepts of socialism and working class power had been eviscerated, extinguished from American political discourse for almost half a century. Today we’re in a different situation. Socialism is becoming popular in the United States. It’s not simply the work of the vanguard to promote socialist ideas. Socialist ideas are spreading. The work of the vanguard now must be to define socialism. To take it from an abstract, lofty, and preponderantly social-democratic understanding of socialism to a different concept -that socialism means first and foremost the taking of power by the working class, by those who labor every day, by those who have nothing to gain from the current capitalist system, and that means reorganizing society in the interest of the majority. We have a new operational slogan which is “A society for the many”. This requires a complete reorganization of how banking and industrial development is carried out; it also means that the profits or the revenues generated from the labor of working people be used to needs of the many. So now we’ve entered a new stage of not just popularizing but defining socialism. We’re drawing sharper definitions and trying to differentiate between revolutionary socialism or communism or working-class power with the notions of social-democracy, which is a socialism that does not seek to overturn the capitalist system but instead modify or mitigate some of the worst features. In the last couple of months the leftist organizations as well as several human rights associations’ organizations, even institutions such as the psychological associations, have denounced and reacted against the tragic, brutal, cruel policies on immigrants of U.S. administration especially against Mexican immigrants. Do you have any solidarity campaigns or moves towards immigrants and refugees as you characterize the working class of the United States as multinational? Do you have special means to organize and recruit people among these workers from different backgrounds and nationalities? EP: The answer is yes to both questions. This is one of the key areas of work for us. First and foremost many of our members, especially in areas with large immigrant populations, come from these backgrounds themselves. Many of them have experienced some of the worst and cruelest policies in their own families, so just by virtue of their own lives as workers they are already involved. The struggle for immigrants really took off in a major way in 2006, when literally millions took to the streets on May Day. Through the ANSWER Coalition we’ve been very active in this struggle. We’ve organized ourselves and participated with other friendly organizations to organize many many large demonstrations since then. In the Trump era too, we’ve participated in many of these urgent protests, some of which your readers may have seen -whether it was the airport protests that took place very shortly after Trump was brought into office against the Muslim refugee ban, against the more recent family separations. On an everyday basis we are functioning in ways that are addressing the immigration issue directly and also the subsidiary issues that affect many immigrants, for instance wage theft. Many immigrants are the biggest victims of wage theft. In the United States we make the point that there is more robbery of workers by capitalists than any other type of robbery. It often targets immigrants’ constructions and restaurants who are the number one target. In the United States this is called “wage theft” where the bosses literally steal the workers’ wages rather than pay them. This is not uncommon. So in several of our cities many our comrades are working on issues like that. We’ve also been working very closely with some of the more targeted populations that have Temporary Protected Status in America. When there are major natural disasters in the Caribbean or in Latin America, people are likely to come to the country and it’s a temporary period and they can be kicked out regardless of what the situation is in their home country. For instance we work closely with the Haitian community in New York City and elsewhere where they are concentrated in their effort to push back against the ending of temporary protected status, as well as the racist demonization of Haitians generally. Because the working class in the United States is so multinational, and because in many major cities the working class is very immigrant based, a large number of our members as I mentioned are the first generation children of immigrants, people who came to the U.S. when they were very very young. We have also been improving our organization and areas close to the U.S.-Mexico border. So we’ve been working on multiple different levels with immigrant populations living close to these areas, where there is a very heavy presence of the state, the police and Border Patrol, who use racial profiling and raids to terrorize immigrant communities. People in some of these border areas even live in informal settlements because they are undocumented and are unable to access resources. We also work with some of those populations to help them fight for their basic needs. So absolutely, immigration is one of the most important areas of work, one of our biggest areas of work and one that is very organic for us so much because the working class of the United States in 2018 is integrated with the immigrant population. It is also in tandem with our work against the police brutality targeting the Black populations. Many immigrants are also very heavily targeted especially in states like California, Arizona, New Mexico. We also try to make sure that we isolate that factor as well and lift it up. BB: We, PSL members, also play an important role in domestic workers’ organizing. The domestic workers in the United States are largely immigrant women and super-exploited. This is a fundamental issue again and you can see that the reason people are coming to the United States is because of U.S. imperialism’s economic and military policy that has created catastrophes, disasters all over the world. So 60 million people are on the move right now, 60 million is more than in any time since World War II. Of course at the end of World War II, it was because of vast military destruction but it’s the economic destruction that is caused by imperialism and attendant wars that were created by this phenomenon today and it’s very important for us and important for the workers’ movement in Europe too. Because as these immigrants and refugees move as a consequence of imperialism, right wing and fascist movements are taking advantage, using the immigrants and refugees as a punching bag, to scapegoat them as if they are the cause of economic and social problems. So we must, in addition to defending immigrant communities and individuals, expose this as the fundamental feature of modern day capitalism. From the heart of the world imperialism how do you consider the international communist movement and in what ways do you engage? BB: We are a communist party. We have existed for 14 years with the idea of building a communist party in the United States once again. This is a complicated and long-term project. It is perhaps the most of the difficult of all projects. But it’s the imperative need because you cannot have revolutionary change without a revolutionary communist party leading that change. Absent a communist party, victory is impossible. We consider the US working class not to be a separate entity detached from the world communist movement but rather as one detachment of the world communist movement. There is no separate destiny for US workers apart from the workers of the world, there is no such possibility. So we are building a communist party in the United States and seeking to coordinate with, and show solidarity with, and learn from the communist parties of the world.